How To Clean Your Apartment's Bathtub The Natural Way - Planned Property Management, Inc. When it comes to self-care rituals to cure the winter blues, a warm, long bath is hard to beat. However, while we scrub our tubs pretty regularly, it’s best to put in a little extra elbow grease before filling it up with water and hopping in for a soak. Let’s face it—tubs can get grimy, and we’d rather give them a deep-clean than risk bathing in anything gross. You may assume bleach is your only choice to totally dispel any germs, but soaking in water containing leftover harsh chemicals isn’t exactly relaxing. Luckily, you’ve got another option. Today, we’re sharing our favorite method you can use to thoroughly clean your bathtub the natural way, just in time for some weekend self-care. Start by covering the bottom of the tub with water. Next, take a container of baking soda and cover the floor of your tub as well as the bottom of your tub’s walls. You should notice a thin film appearing as you sprinkle the baking soda onto the water. Next, mix a few spoons of baking soda with vinegar in a bowl to create a paste. 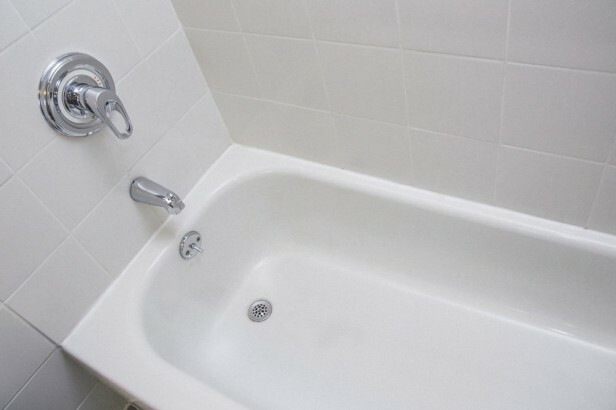 You can use this to remove stubborn sludge and stains from the tub floor and tub walls. Let the baking soda paste and water solution sink in for a few minutes. In the meantime, add some vinegar to a spray bottle. After a few minutes, spray the entire tub down with the vinegar. It will create a fizzy reaction. Take a clean wet towel and begin rubbing and wiping down the baking soda mixtures. Rinse out your rag as you go to get your tub as clean as possible. Rinse down with water once you’re done scrubbing. Repeat again if you still see stains or scum.